The copyrights to some of these publications are held by their publishers. The pdf files provided here may be used only for single copies for personal use, as though they were reprints provided by mail. They may not be reposted on other web sites or used for any other purpose without the express permission of the appropriate publishers. Morphological transitions of vesicles induced by AC electric fields, S. Aranda, K. A. Riske, R. Lipowsky and R. Dimova, Biophys. J, 95, L19-L21 (2008). Transport of beads by several kinesin motors, J. Beeg, S. Klumpp, R. Dimova, R. S. Gracia, E. Unger and R. Lipowsky, Biophys. J, 94, 532-541 (2008). Optical tweezers in interaction with an apertureless probe, P. Chaumet, B. Pouligny, R. Dimova and N. Sojic, J. Appl. Phys. 102, 024915 (2007). Behavior of giant vesicles with anchored DNA molecules, V. Nikolov, R. Lipowsky and R. Dimova, Biophys J. 92, 4356–4368 (2007). 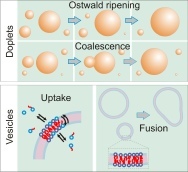 Control of the interaction between membranes and vesicles: adhesion, fusion and release of dyes, D. Volodkin, V. Ball, J.-C. Voegel, H. Möhwald, R. Dimova and V. Marchi-Artzner, Coll. Surf. A, 303, 89-96 (2007). Novel method for measuring the adhesion energy of vesicles, T. Gruhn, T. Franke, R. Dimova and R. Lipowsky, Langmuir, 23, 5423-5429 (2007). Implementing both short- and long-working-distance optical trapping into a commercial microscope, P. Kraikivski, B. Pouligny and R. Dimova, Rev. Sci. Instrum. 77, 113703 (2006). Timescales of membrane fusion revealed by direct imaging of vesicle fusion with high temporal resolution, C.K. Haluska, K.A. Riske, V. Marchi-Artzner, J.-M. Lehn, R. Lipowsky and R. Dimova, Proc. Natl. Acad. Sci. USA. 103, 15841–15846 (2006); from the cover. Electrofusion of model lipid membranes viewed with high temporal resolution, K. A. Riske, N. Bezlyepkina, R. Lipowsky and R. Dimova, Biophys. Rev. Lett. 4, 387-400 (2006). Binding of ion pairs onto polymer gels via dehydration entropy: a new mechanism for ion exchange, C.G. Sinn, R. Dimova, C. Huin, Ö. Sel, and M. Antonietti, Macromolecules 39, 6310-6312 (2006). Electric pulses induce cylindrical deformations on giant vesicles in salt solutions, K. A. Riske and R. Dimova, Biophys. J. 91, 1778-1786 (2006). Using Multiporator® to master vesicle electrofusion, R. Dimova and K. A. Riske, Eppendorf BioNews Application Notes, 25, 7 (2006). Review: A practical guide to giant vesicles. 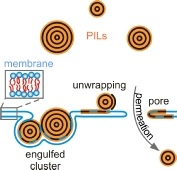 Probing the membrane nanoregime via optical microscopy, R. Dimova, S. Aranda, N. Bezlyepkina, V. Nikolov, K. A. Riske and R. Lipowsky, J. Phys. : Condens. Matter 18, S1151-S1176 (2006). Binding of calcium to phosphatidylcholine-phosphatidylserine membranes, C. Sinn, M. Antonietti and R. Dimova, Coll. and Surf. A 283, 410-419 (2006). Influence of different salts on micro-sized polyelectrolyte hollow capsules, R. Georgieva, R. Dimova, G. Sukhorukov, G. Ibarz and H. Möhwald, J. Mater. Chem. 15, 4301-4310 (2005). 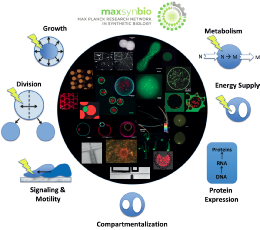 Composition dependence of vesicle morphology and mixing properties in a bacterial model membrane system, B. Pozo Navas, K. Lohner, G. Deutsch, E. Sevcsik, K. A. Riske, R. Dimova, P. Garidel and G. Pabst, Biochem. Biophys. Acta Biomembranes 1716, 40-48 (2005). 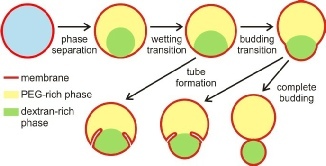 Wetting, budding, and fusion - morphological transitions of soft surfaces, R. Lipowsky, M. Brinkmann, R. Dimova, C. Haluska, J. Kierfeld and J. Shillcock, J. Phys. : Condens. Matter 17, S2885–S2902 (2005). 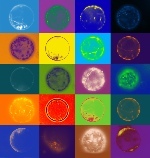 Electro-deformation and -poration of giant vesicles viewed with high temporal resolution, K. A. Riske and R. Dimova, Biophys. J. 88, 1143-1155 (2005). 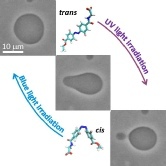 Droplets, bubbles, and vesicles at chemically structured surfaces, R. Lipowsky, M. Brinkmann, R. Dimova, T. Franke, J. Kierfeld and X. Zhang, J. Phys. : Condens. Matter 17, S537-S558 (2005). Fusion of functionalized giant vesicles. C. Haluska, V. Marchi-Artzner, J. Brienne, J.-M. Lehn, R. Lipowsky, R. Dimova, Biophys. J. (Annual Meeting Abstracts). 88:66a (2005). Timescales involved in electro- deformation, poration and fusion of giant vesicles resolved with fast digital imaging. K. Riske and R. Dimova, Biophys. J. (Annual Meeting Abstracts). 88:241a (2005). Binding of avidin to biotinylated membranes: isothermal titrational calorimetry study. V. Nikolov, R. Dimova, Biophys. J. (Annual Meeting Abstracts). 88:581a (2005). Isothermal Titration Calorimetry of the Polyelectrolyte/Water Interaction and Binding of Ca2+: Effects Determining the Quality of Polymeric Scale Inhibitors, C. Sinn, R. Dimova, and M. Antonietti, Macromolecules, 37, 3444-3450 (2004). 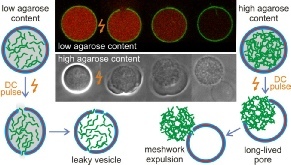 High temporal resolution of electro- poration, fusion and deformation of giant vesicles. “Squaring” the vesicles. K. Riske, R. Lipowsky, and R. Dimova, Biophys. J. (Annual Meeting Abstracts). 86:518a (2004). 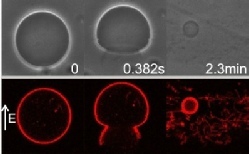 Fusion of giant vesicles observed with time resolution below a millisecond. C. Haluska, V. Marchi-Artzner, J. Brienne, J.-M. Lehn, R. Lipowsky, R. Dimova, Biophys. J. (Annual Meeting Abstracts). 86:519a (2004). 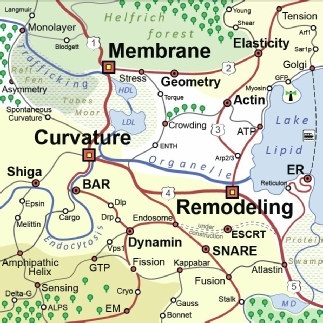 Changes in the Membrane Spontaneous Curvature Induced by Grafting of Long Polymers. V. Nikolov, R. Lipowsky, H.-G. Döbereiner, R. Dimova, Biophys. J. (Annual Meeting Abstracts). 86:197a (2004). Hyperviscous Diblock Copolymer Vesicles, R. Dimova, U. Seifert, B. Pouligny, S. Förster and H.-G. Döbereiner, European Physical Journal B, 7, 241-250 (2002). 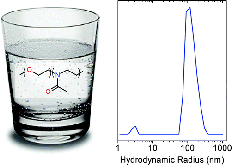 Polyampholyte-Dressed Micelles of Fluorinated and Hydrogenated Dodecanoic Acid, A. Thünemann, K. Sander, W. Jaeger, and R. Dimova, Langmuir, 18, 5099-5105 (2002). Book chapter: Absorbing microspheres in water: laser radiation pressure and hydrodynamic forces, R. Dimova, H. Polaert and B. Pouligny, in "Scattering of Shaped Light Beams and Applications", (Gouesbet and Grehan, Eds.) Research signpost, 45-65 (2000).